The Rainbow Daytona is Rolex's extravagant chronograph. Sapphire stones in the colors of the rainbow decorate the bezel, and diamonds stud the case and dial. Thanks to its stopwatch function, this striking timepiece is also a functional accessory. 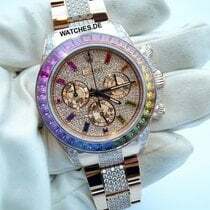 It's hard to miss a Rolex Daytona Rainbow thanks to its characteristic gemstones that shine in the colors of the rainbow. Thirty-six baguette-cut sapphires adorn the bezel, sparkling in bright red, orange, yellow, green, blue, and purple. Most examples use eight diamonds to mark the indices, though some use 11 precious stones instead. Gems also ornament the lugs and crown protector on many examples. Like every Daytona, the Rolex Rainbow also functions as a chronograph. The in-house caliber 4130, introduced by Rolex in 2001, allows you to time periods of up to 12 hours. Thanks to its frequency of 28,800 vibrations per hour (A/h), you can measure the time to an eighth of a second. How much does a Rolex Rainbow cost? 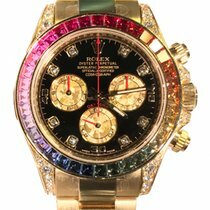 The Rolex Rainbow is one of the most coveted versions of the Daytona among Rolex fans and watch enthusiasts. This is due to its colorful appearance in contrast to the subdued tones of typical Rolex watches and to the fact that only a very limited number were produced. The most eye-catching part of this watch is without a doubt the bezel, with its 36 baguette-cut sapphires that shine in the colors of the rainbow. The lugs and crown protector are also adorned with diamonds, and the black dial bears eight diamonds as hour markers. Only the 3, 6, and 9 are marked with golden Arabic numerals (15, 30, and 45). A golden five-pointed Rolex crown occupies the 12 o'clock position. The luxury watch manufacturer uses a gold alloy on the small seconds dial, the 12-hour counter, and 30-minute counter. This alloy is reminiscent of a gold nugget and matches the color of the 40-mm case. On the example with reference number 116598 RBOW, the case is made of 18-carat yellow gold, while on Ref. 116599 RBOW it is made of 18-carat white gold. Don't let its glitzy appearance fool you – the Rolex Rainbow is also a high-quality chronograph. The in-house caliber 4130 ticks away inside of it with the precision of a certified chronometer. Of course, such a coveted watch comes at a price. A new Rolex Rainbow in yellow gold goes for around 220,000 USD, and a model in white gold costs around 228,000 USD. Pre-owned models are only marginally less expensive, at 208,000 USD for yellow gold and 152,000 USD for white gold. 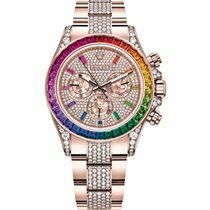 In early 2018, Rolex announced that it would be introducing a Daytona Rainbow in Everose gold. In contrast to the yellow and white gold models, the index markers on the Everose model with Ref. 116595RBOW are made of the same colorful sapphires found on the bezel. The price for the rose gold model is only available upon request, but it is safe to assume that it is similar to the other Rainbow models. Since the original Rainbow is such a rare model, there are also numerous replicas on the market. Interesting among these are the so-called aftermarket models, which can also be found on Chrono24. These watches are authentic Daytona models that were subsequently fitted with colorful stones. The stones are often simple crystals, though sometimes sapphires and diamonds are used. Overall, the quality of the aftermarket models cannot compete with a real Rainbow from Rolex. This is clear from the subdials, which often look copied, and the lower quality color of the crystals added to the bezel. That being said, one of these modified Daytonas is significantly less expensive than an original. A model with a stainless steel case goes for as low as 21,000 USD, whereas a gold model costs around 31,000 USD and a white gold model around 35,000 USD. The 40-mm case of the Rainbow Daytona is available in 18-karat white, yellow, and Everose gold. The yellow gold model has the most impressive appearance, with its matte black dial and diamond indices. There are golden Arabic numerals (15, 30, 45) at the 3, 6, and 9 positions, and the five-pointed Rolex crown is located at 12 o'clock. The golden, camouflage-patterned subdials at three, six, and nine o'clock function as the small seconds, 30-minute counter, and 12-hour counter, respectively. The three small hands are red like the main stopwatch hand, while the other central hands for the minute and hour are golden. Precious gems such as diamonds and sapphires make the Rainbow even more valuable. Most noticeable are the 36 baguette-cut sapphires on the bezel, which span the entire color spectrum of the rainbow, from red to purple. White, "brilliant-cut diamonds" cover the lugs and crown protector. A three-piece link Oyster bracelet made of 18-karat yellow gold keeps the watch securely on your wrist. The Daytona has been connected to racing from the start. Rolex presented the timepiece in 1963, naming it after the eponymous race track in Daytona Beach, Florida. The chronograph was introduced at a time when racing chronographs dominated the industry. Today, Rolex is still best known for three-hand watches; some of their most popular collector's watches are the Submariner and GMT-Master. This could be one reason why the Daytona didn't sell well at first. Vintage Daytonas from the 1960s are thus especially rare and sought after. The "Paul Newman" is one of the most beloved Rolex chronographs, named after the actor and racer Paul Newman. It's said that he received his first Daytona as a gift from his second wife. Newman wore the watch while racing, which contributed to its fame. In late 2017, a model worn by Newman was auctioned for the record-setting price of 17.75 USD. The watch overtook the previous record holder, a Patek Philippe Ref. 1518, as the most expensive watch in the world. Unlike typical Daytonas, the Paul Newman model has a contrasting dial edge. The three subdials feature Arabic numerals in an Art Deco style with small squares at the end of the line indices. The Rolex Rainbow has been powered by the in-house caliber 4130 since 2001. The balance wheel with a blue Parachrom hairspring vibrates at 28,800 A/h. It has been made of a zirconium-niobium alloy since 2005, making it unaffected by magnetic fields. The watch is regulated via Microstella nuts on the balance rim, as is every Rolex in-house caliber. Normally, a watch requires a regulator, which lengthens or shortens the balance spring, thereby influencing the movement's precision. The power reserve is 72 hours, or 66 hours if the chronograph function is turned on. The watch is also water resistant to 100 m (328 feet or 10 bar) thanks to a screw-down case back, push-pieces, and crown.